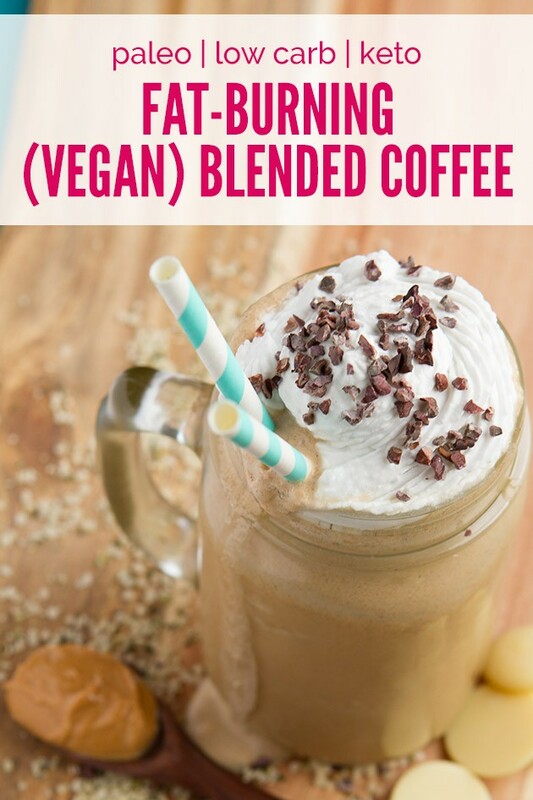 A sugar-free, dairy-free, completely vegan and keto-friendly blend of super ingredients to kick start your fat-burning morning. It’s time you and I started thinking about summer, yes? I’m slightly infatuated with the frappucino. But a lot has changed since last summer and those sugar bombs I used to treat yourself with once a week (read: every other day) are no longer in my repertoire. At least, I don’t want them to be. So, I came up with a solution. 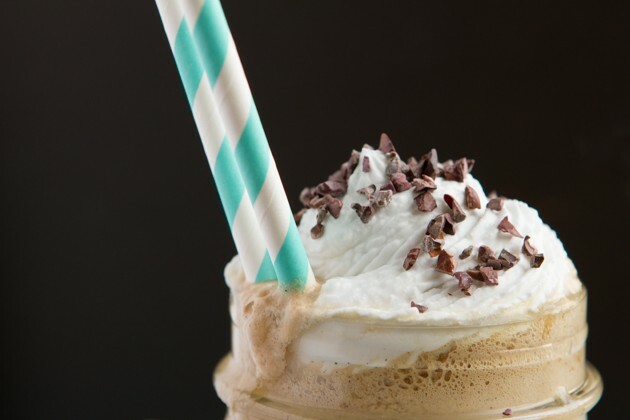 It’s simple, it’s tasty, it’s sugar free, it’s keto, and (I hope) it blows your mind. Now… wait! There’s this article going around that drinking keto Bulletproof Coffee for breakfast is “shooting yourself in the foot”. First off, based on my own experience, swapping breakfast for a high-fat, keto drink and practicing intermittent fasting is the best thing I’ve done for my health, ever. Watch: What 6 Months Of Eating High Fat, Keto Did To My Body. Secondly, keto rocket fuel lattes or my (new!) 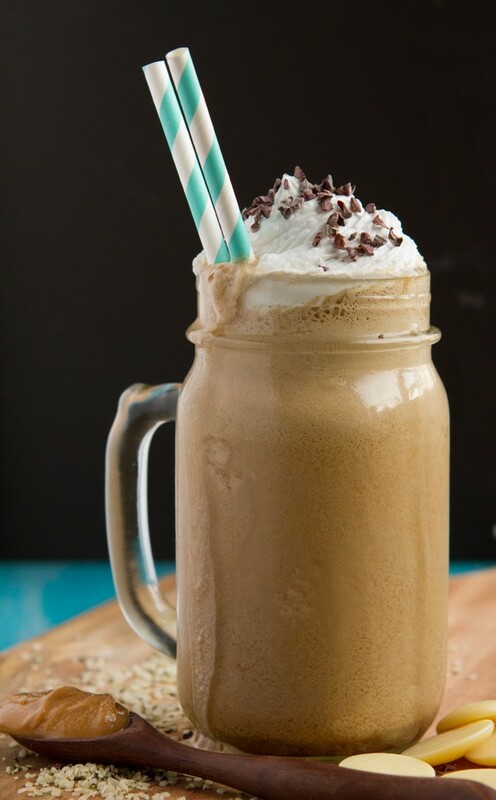 keto rocket fuel iced blended coffee recipes should not be compared to Bulletproof coffee. 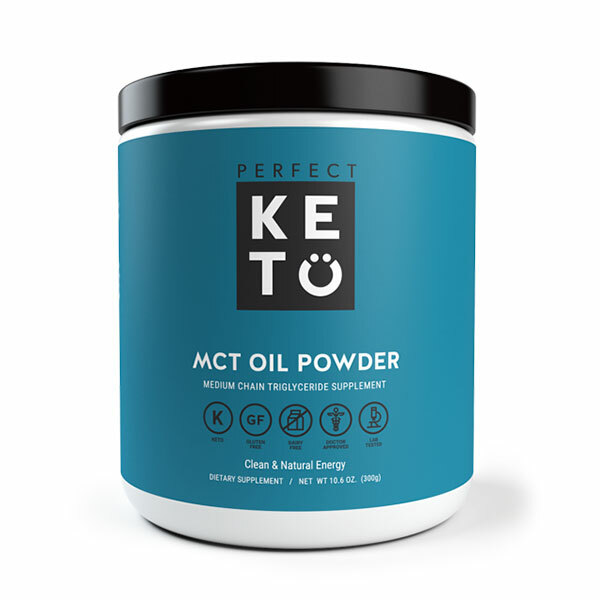 I created these keto drinks to specifically assist women in burning fat all morning long while regulating hormones and abolishing cravings, something that the classic keto “butter coffee” fails to achieve for many. Whether you chose to live a high-fat, keto life (as I am doing right now), or you’re looking at trying something new for breakfast; maybe your green smoothie or oatmeal bowl just isn’t cutting it? Then you should give keto rocket fuel a try. Best enjoyed as a keto breakfast, as soon as you get hungry in the morning. Watch this if you’re curious about why/how this keto drink sends the right messages to your hormones. A (creamy) vegan and keto upgrade to the classic butter coffee… on ice and without the butter! Specifically made to assist women in burning fat all morning long while regulating hormones and abolishing cravings. 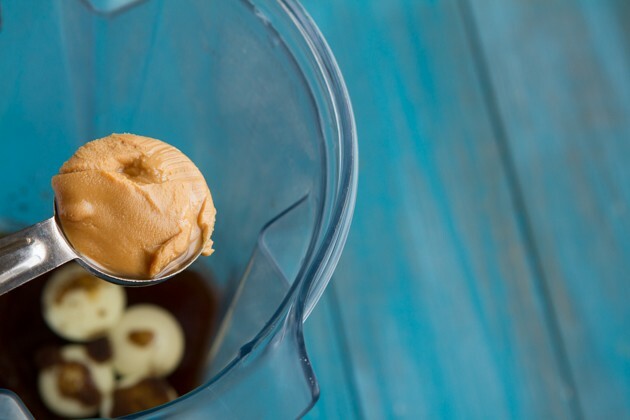 Blend coffee, almond butter, cacao butter, MCT oil, stevia, vanilla and cinnamon in your high-powered blender. Transfer to a jar and place in the fridge to cool completely. I do this step the night before so I have a nice, chilled jar the next morning. Once chilled, place back in your blender. Add 4-6 ice cubes. 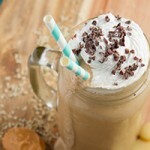 If you are not using a high-powered blender, it’s best to break up the ice before you add the coffee. This way, it won’t heat up your drink! Blend until the ice is crushed. 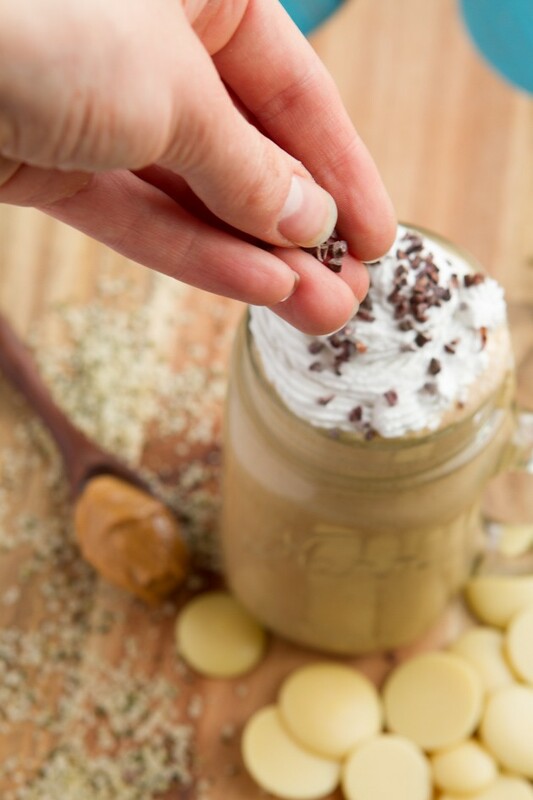 Pour into a jar, top with coconut whipped cream, cacao nibs and enjoy! 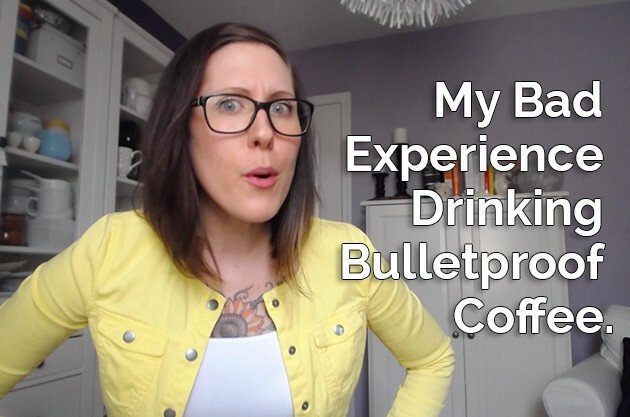 Again, if you missed it, watch this video on why I choose to drink this instead of keto Bulletproof coffee. The key here is smooth almond butter. I use Barney Butter Bare Smooth. It has no sugar or added ingredients, so it’s keto. If almond butter or almond products hurt your stomach, it could be because of the almond skins. 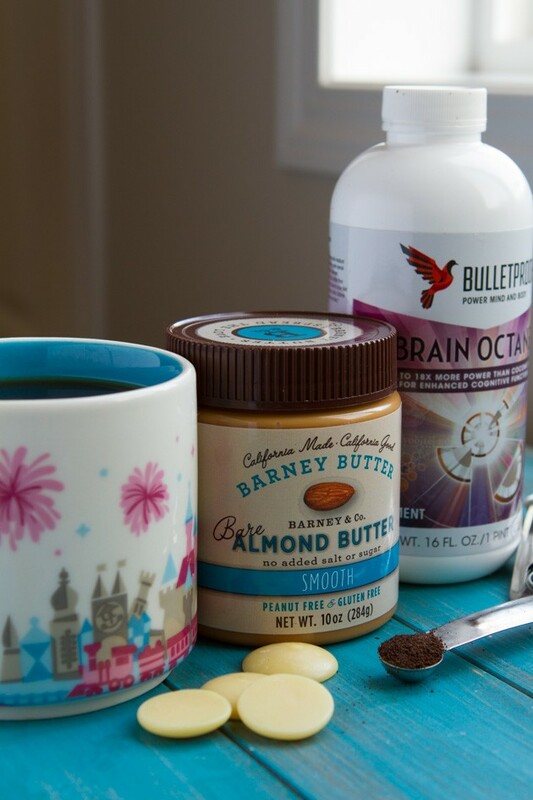 Barney Butter uses skinned almonds only, leaving my tummy happy as can be. Cacao wafers. Are a life saver! If you’ve purchased cacao butter (the caffeine-free, dairy-free, and keto-tastic fat in chocolate) before, then you know it often comes in big blocks that you have to smash to get apart. Not with these wafers! I’m so thrilled I found them a couple of weeks ago. So handy! And, they make great high-fat, keto crackers for nut butters and other fun keto ingredients. Topping your finalized keto drink with cacao nibs is optional, but highly recommended.